Hello, beauties! 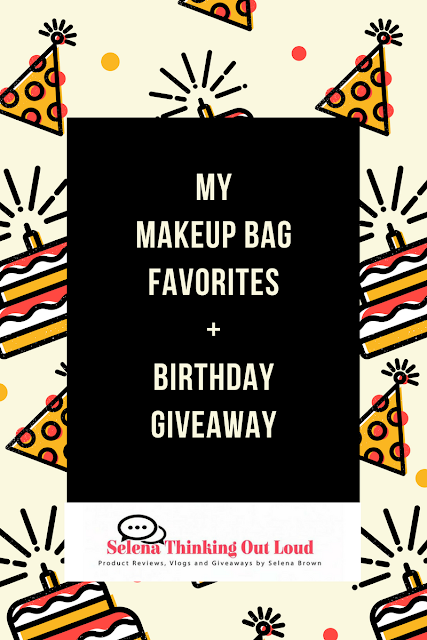 Today I'm going to share with you My Makeup Bag Favorites + Birthday Giveaway! Today is my birthday, JUNE 9th! I am SUPER blessed to see another year. God is SO good. He continues to bless me to be a better person and have the strength to make everyday a great day! I hope the same thing for you too. I enjoy wearing makeup to jazz up my look! I also like going all natural too ;) It really depends on how I feel from day-to-day. Today, on my birthday I wore my favorite make up brands from Neutrogena Shine Control Primer, L'Oreal Paris True Match Super-Blendable Foundation, Soft Sable to Maybelline 24K Nudes Eyeshadow, Wet 'n Wild Comfort Zone Eyeshadow, and Maybelline SuperStay 24 Lipcolor. Everything that I enjoy wearing is in my makeup bag and you will get the opportunity to win my birthday makeup bundle! To learn more about My Makeup Bag Favorites, watch my video blog below. Then, scroll down further and enter my Birthday Giveaway for one (1) lucky winner. All entries are optional. No purchase necessary. Good Luck! Disclaimer: Selena Thinking Out Loud is hosting this giveaway. e.l.f cosmetics, Maybelline, Wet n' Wild, Neutrogena, Facebook, Instagram, Twitter, or any other entity is not responsible for prize delivery. All entries are optional. No purchase necessary. The winner will be contacted via email that is entered in the Rafflecopter Entry Form. Good Luck! Open to US Only. Would you like Selena Thinking Out Loud to host a giveaway for your brand or do a product review video? Contact Us here. Hoping to have family and friends over to celebrate with me. My family (parents, sis) came over to have a party. And we had friends over another day to celebrate. My birthday is in a week. Plan on spending it with my husband. It was my 50th, but didn't do anything..I had to work. I will probably just go out to dinner for my birthday. My husband took me out to a nice dinner. I will have a quiet evening with my husband watching a movie, and eating pizza. I stayed home, the older I get the more occasions like this means moments to myself to reflect and grown. This year it will be a quiet birthday and I might make myself a birthday cake. My husband and I went out to dinner and then we had cake at home with the kids. I threw myself a dinner party!! Twelve of my friends came to celebrate with me. We had wine, food, and laughter. The best way to turn 41!! !